Randy has been married to his wife, Kathy, for over 40 years. They have five grown children (two of whom are adopted), and five grandchildren (one in heaven). He grew up south of Chicago and graduated from Northern Illinois University (B.S.) and Denver Seminary (M.A.). Randy joined the staff of the Bible Church on Labor Day Sunday, 1980. 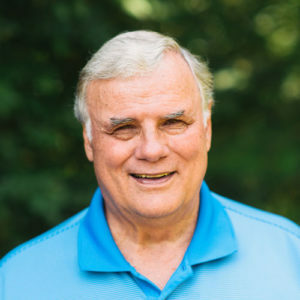 During his ministry here, Randy has helped over 230 couples begin their marriages and was the founding pastor of Chatham Community Church in Pittsboro, NC. He retired from full-time ministry in summer of 2017, but continues part-time in a counseling capacity. In my many years at CHBC, I have been able to lead people to the Lord, to grow in the Lord, to become servants and leaders, and to mature in their relationships. Over this time I have seen the church grow in expressing gifts, expressing unity, expressing diversity, and living together in the gracious life of Jesus. Randy enjoys playing golf, watching the Chicago Cubs, studying history - particularly the Civil War and Abraham Lincoln. You can find Randy's research on Abraham Lincoln and slavery at his website.